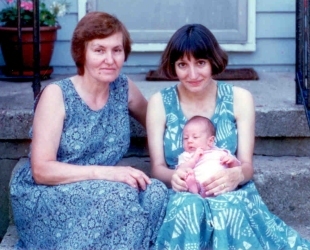 My mother’s illness was difficult for our entire family. The last year of her life, grandma (or ‘baba’ as everyone called her) had to stay in a nursing home. She was too sick to live with us. My sister and I (sometimes alone and sometimes with our husbands and children) visited baba almost every day. We took her for walks in the sunshine, we sat with her, we fed her, we washed her and cleaned her room. We got to know all the residents of the home and became friends with the nurses. The children would entertain the patients with piano recitals, various games and cupcakes with afternoon teas. spit, the skin peeling away from her lips. parties, pink hair curlers, mink-fur coats. with the weight of some other. as asphodel in the space around her. Thanks John, my daughter is a jewel. Takes after her grandmother. Best to you! I’ll take you at your word, but she got her writing ability from her mother. 😉 Good writers seem to be becoming much rarer and I am heartened when I come across one. In this case, it’s a double pleasure as some of what you write about takes me back to both recent and distant times, both here and in Serbia. It’s so generous that you are sharing your writing about your life with family, friends and the rest of us — a gift! Your daughter is certainly a chip off the old block! Vrlo dirljivo. Thank you for letting us read it. She got her charm and her beauty from her baba. Also, her love of poetry. Best. These last two posts have been so hard to read, and also so beautiful. I remember that period of all our lives very well. Neither the good memories nor the the horrific ones fade easily. But more than anything else, I’m impressed by the courage and ability (imperative?) to go forward theys show. You’ll aways be my Mrs. Ramsay. Nena, thank you so much for sharing your beautiful poem. I love it. You were with us every step of the way. Your kindness to our mother and your friendship with her, made it all bearable. Thank you, dear sister.